As the World celebrate international malaria day, a team of Doctors and Nurses from School of Health Science Kaduna, Saturday, diagnosed more than 200 destitute with intention of eliminating malaria virus in their surrounding. The team, headed by Hajia Maryam Abubakar, arrived at the Destitute Home at kaduna-kano road, at wee hour, Saturday before they hit the streets to beg for alms. The team, after offering free medical services are expected to give them Anti-malaria drugs with mosquito net. Hajiya Maryam, said mosquito-borne diseases are major cause of illnesses and deaths worldwide, adding that only advances in research and tools to fight malaria will help transform how to combat other infectious diseases, like Zika Virus, Malaria, Black flies, Tse-tse flies and other dangerous flier surrounding our environment. Hajia Maryam added that this year’s celebration, she and other members of the team targeted selected disabled persons because of the daily challenges they face, saying that they felt they are the most neglected persons in the society and they dont usually go for any medical health diagnosis due to poverty and lack of awareness. Series of tests conducted include blood pressure, malaria, typhoid, and distribution of free treated mosquito nets and antimalaria drugs to women and children and elderly disabled persons. According to Hajia Maryam, “the theme for 2016 is “End Malaria For Good”. Following the great progress made under the Millennium Development Goals, and it is important to build on this success and end malaria for good’ under the Sustainable Development Goals. “Eliminating malaria will make the world a better, and a safer place for future generations and enable millions of people to reach their full potential and this will help the world in reducing all related disease associated with Dangerous flies surrounding our communities. “Majority of physically challenged persons in Nigeria dont usually go for medical check-up or any health diagnosis. As such, this really contribute in making many of them dying with ill-related disease like malaria, typhoid and colera and other communicable diseases. She however dressed that ending malaria transmission will increase the quality of life of millions of people and free up resources that are currently being used to fight the disease and investing in investment in the malaria fight is one of the best buys in global health. She then call on all philantropist, federal and state government, non governmental organizations and development partners to redoubled efforts in the fight against the spread of malaria second only to routine immunization. 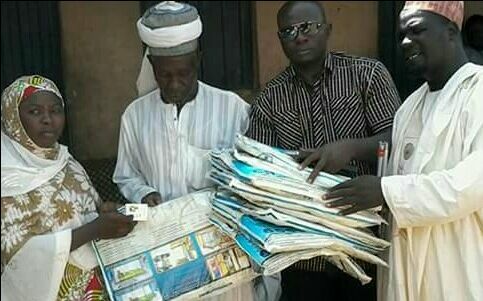 Responding on behalf of the destitute Spokesperson of Northern Blind Forum, Mallam Muntari Saleh, said this is the first of its kind in the history of Nigeria for some one to think of diagnosing them for their health matters and conselling them on serious issues surrounding their lives.